Ever since Tyrone Power and Annabella announced they were separating permanently, they have been besieged by hundreds of newspaper and magazine writers who wanted the real story behind the collapse of their "ideal" international marriage. Unlike other Hollywood stars, both Tyrone and his dainty, beautiful French wife consistently refused to discuss their estrangement for publication. The truth is that they talked very little about it to their most intimate friends. That started the ugly rumors flying like poisoned arrows. Tyrone and Annabella persisted in their silence. Each of them was too bewildered and hurt by what had happened to talk about it to anyone. That is something you will be able to understand fully only after you read the exclusive inside story her, in the pages of Movieland, of how and why their marriage broke up. Fantastically enough, some months after the Powers’ parting, Annabella was cruelly attacked both in the press and on the air. The gossip-peddlers denounced the tiny French star “for delaying getting the inevitable divorce as a subtle method of revenge. Because her own happiness has been destroyed, she is making sure that Tyrone won’t have any happiness either. Not a world of this happens to be true. More than anything else, it was this flood of unfair criticism that convinced Annabella to tell the inside story of her love troubles to this reporter. By the time you read this, she probably will have brought suit for divorce against Tyrone. The inside story behind that wrecked marriage is one of the saddest and strangest in Hollywood’s stormy marital history. For four years every friend who entered the Powers’ palatial home, left feeling that he was the happiest and luckiest star in pictures, that he’d made a dream marriage when he walked to the altar with the bewitching little French actress. If it looked like the marriage between stars that would last forever, it was because Annabella worked twenty-four hours a day, as most French women do, at the job of keeping her husband happy and contented. When Annabella became Mrs. Tyrone Power in 1939, she gave up her own brilliant acting career. She had every intention of never appearing on stage or screen again. “I abandoned my profession,” she told me, “because I didn’t believe I could both act in pictures and keep Tyrone happy. With husband and wife both in pictures, you never are able to see one another as often as you like. What Annabella was relinquishing when she gave up screen acting should not be underestimated. All her life, until then, she was obsessed by only one ambition: to be a screen performer. Annabella, whose real name is Suzanne Charpentier, was in seventh heaven when a friend of her father, Pierre Charpentier, the director of a French weekly magazine, got her a screen test in a Paris studio. Her beauty and her burning ambition won success for her in her native country. When an English company sent for her to play the main role in “Wings of the Morning,” she learned perfect English in three months. Previously, she had gone to Hollywood to make the French version of “Caravan,” with Charles Boyer - and spent in the American film capital the loneliest year of her whole life. Her great success in “Wings of the Morning” won Annabella a starring contract with Twentieth Century, and back to Hollywood she came. This time she wasn’t lonely at all. Tyrone first fell in love with her when he pulled her out of a mud-hole in “Suez”. Impetuously, he embarked on a whirlwind courtship. For a long while, Annabella didn’t know whether to marry him or not. Though already established as a box-office champion among the colony’s charm and glamour boys, he was younger than she. Annabella had been married twice before, and, before deciding, she wanted to make sure she wouldn’t make another romantic mistake. In the goldfish bowl of Hollywood, it was difficult to get a clear perspective. She was deeply attracted by Tyrone, but puzzled. He bombarded her with flowers, presents, telephone calls. A few weeks later, they were married. The truth was that Annabella, who is very adaptable temperamentally, had interested herself as intensely in Ty’s career as she once had been in her own. She is naturally pert, witty and wise. When he wanted to go nightclubbing or to a party, she was eager and ready. If he wished to stay home, that was all right with her. She rehearsed his scenes with him, listened to his problems and tried to help solve them. When the Germans swept around the Maginot Line and began to smash the great French army as though it were a toy, Annabella began to spend every waking hour at the radio, listening to the bad news, worrying about her brother, Pierre, who had been captured by the Germans, her father, her family, her imperiled friends in Paris. Only Ann, her young daughter by her first marriage, was safely in America. Annabella decided one day that the therapy of work was the only thing that would save her foundering marriage. She’d kept as busy as possible working for the Red Cross and French relief agencies, appearing at benefits for war victims frequently, as well. Tyrone understood her urge for self-expression. One summer they appeared together, in the East, in a summer theater production of “Liliom”. Later, when an offer came to play the magnificent part of the ghost in the play, “Blithe Spirit”, in Chicago, she jumped at the chance. She played in Chicago for five or six months. Ty came to see her as often as he could get away from Hollywood. Each visit was like another honeymoon. Once more, they got along together perfectly. When Annabella returned to the Coast, she again plunger herself into war relief work and appeared at many camp shows. She also made a couple of American pictures while he was away. When, after America’s entrance into the war, Ty enlisted as a private in the Marine Corps, she was immensely proud of him. Now they were together in the war. Ty went to the Pacific as a flyer, became an officer. In their affectionate correspondence there was no hint that their marriage would be dissolved. They even discussed by mail making certain changes to their home. 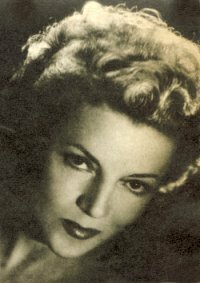 During the war, Annabella made a hit on Broadway in “Jacobowsky and the Colonel”, and also played “Blithe Spirit” with a USO unit in Italy and France. Her brother, Pierre, 21, had escaped from the German prison camp, but had died. Annabella managed to get to Paris in time to see her father before he, too, died. All the while she was away in Europe, Annabella kept hoping that Ty would either get time off to see her, or be transferred to a post in the European theater. But that didn’t happen. They never were able to meet. Later, Annabella got a chance to go to the Orient with another USO unit, but Ty cabled her that he expected to be discharged soon and to wait for him in America. When he finally returned to Hollywood, the brilliant young star was restless and unhappy as millions of other Americans. Annabella understood that. But despite all she could do, she sensed that, little by little, they were drifting apart. Nothing she tried seemed to please him. Then the incredible happened, something that could only break up a marriage in Hollywood. Ty was to get the great part of Larry in “The Razor’s Edge”. He read the W. Somerset Maugham book, and thought it magnificent. Somehow or other Ty, the returned soldier, began to identify himself with the role he was playing, that of Larry, the restless ex-soldier who traveled the world over to find some new spiritual values in life. At first, Annabella wasn’t too disturbed. Being a performer herself, she realized it would be good for his career, that his performance would be more convincing, if he lived the role while he was playing it. If you remember the book or picture, you’ll recall that, in “The Razor’s Edge”, Larry gave up money, career, position, family, friends to pursue his quest for spiritual rebirth. Tyrone, from time to time, Annabella says, talked of giving up his career, money, his whole wealthy and valuable life to go on a similar search for a more spiritual life. After the picture was completed, Ty began talking about taking off on a three-month trip around South America. Annabella began to worry. “Yes, I do,” he told her. They announced their parting upon Ty’s return from the South American trip. I asked Annabella if she felt bitter toward Lana Turner, who marriage to Tyrone Power at this time had long been rumored would follow his divorce. Annabella had just completed work in the French picture “She Was Called Lilli”, a Francine Production, made in Paris. In Hollywood, in addition to arranging for her divorce, she will discuss her future acting plans with Darryl Zanuck. She has a contract with his company, Twentieth Century-Fox, calling for her to make two more pictures. One may well ask, “And now what Annabella?” The clever French actress would like to know the answer to that herself.